I gave up a comment on a blog the other day, after not getting the CAPTCHA right three times! Too much like hard work. I did tell the blogger, so hopefully they'll consider getting rid of it. I did read another blogger who said even though you can turn it off, sometimes Blogger just puts it back again - is that true? Great 'following' tips - I'll be returning to take notes! But, I get what you're saying, you can have lots of followers but you do need the connections as well. Or else, why are you blogging? Susan, how does one type upside down? Never had word verification either. Lurker, I hope to meet more in the real world. Annalisa, never heard of it coming back on again! It's a setting in one's profile so not sure how that could happen. Clarissa, that's right. I have a large list of those I visit all the time, but they also return the visit. I've made a lot of great friends with interacting. It's important to have the right type of interaction in blogging. I despise that new two word captcha!!! And thanks for the heads up on the captcha thingie. Think I'll change mine to blogger approval. I just recieved a comment on my post regarding the new 2 word verification, just before I read your post! I went into my profile and I think I've turned the annoying thing off, but I can't be sure. Please let me know if I have! If I haven't does anyone know how to turn it off exactly? I am with you Alex, it is very important to take the effort to reply when you can to your network, but of course with a network so big I still don't know how you accomplish it! It bothers me that I can't spend the time necessary to visit the folks I want to. I have a list of maybe half a dozen that I'll find a way to visit every day but beyond that I just do what I can. I totally agree with you on the whole blogging thing. You must make connections and support others. Please let me know if I have that annoying thing turned on. I'm going to check it out now. These are great tips on blogging I so agree with. You do have to be a friend and visit and comment. But thank you for saying it's okay not to visit all the time. Because I find with my blogging even once a week that it's a lot of work and I am now getting lots of comments to reply to. So yes, I cannot get to everyone's blog every day even though I want to. THANK you for pointing out that word "thingy". I feel like I"m taking an eye exam and flunking each time I have to do it. And re: followers, I have connected with some and although I haven't had much for them to comment on, I hope they feel my connection to them. What does it mean though when you LOSE a follower. Your posts about blogs and followers are right on. Love your dedication and I hope to live up to your excellent standards. The new word verification is (insert favorite curse word here). On another blog, I messed up four times. It doesn't make me want to return anytime soon. Going to TBR now. At first, I read this as PBR. I thought, Wow. Alex likes rodeo. I always get the captchas wrong. I do have it on my blog but now I think about it, I really would love for robots and aliens to come visit, how cool would that be, so I'm gona turn it off, thanks! Great post about followers, Alex. It's sad but yes, you do realise you can't visit everyone any more at some point. You're such a generous blogger that you deserve every last one! I'd almost reached 1000, okay almost 300 off, but I was getting there. Now, I'll lose 459 March 1st to Google Connect. Off to TBR. I can't read the second word on the verification screen - the one with the box behind it and the colors inverted. It should at least be human-readable, right? But what if I am a robot...Yes, I hate those boxes. Also, the new Twitter threw me for a loop when I logged in. I normally use Hootsuite. As for fellow bloggers as friends? You, Ninja Alex, rock. Enough said. Facebook's forced switch to its timeline format has me grumbling. I don't mind the word verification unless Blogger's being a bugger and rejecting everything I type in, lol. Thanks for the shoutout for TBR too - glad you were a guest today. CM, I just give it my all. I'll go by and see if you have it off. Rusty, then I appreciate the fact that I am one of those people. Natalie, sometimes we can't and that's all right. Em, it's probably just someone with whom you never connected anyway. Don't worry. Huntress, that made me laugh! I guess I'd be the rodeo clown. Anna, thanks! I notice it mostly on new blogs. Once you get used to blogging, it becomes easier to drop it. Thank you for the opportunity, Cate. I'm with you on the word verification. Axe that!! This TBR site sounds fab. I'm heading over to check it out. Agreed on the word verification. It's too much of a strain on the eyes to read most of them. Or you have to reload the image a few times until you get one you can actually see. I haven't noticed new changes to Twitter very recently, but I view it three or four different ways, so maybe I'm just used to things looking and acting differently between web and mobile and app versions. egads am i with you on the word verification! As always Alex, great advice, especially connections. I always appreciate when you stop by. Thanks. I truly believe it's the quality of the connections, not the quantity, that make all the difference in the world. Huge things happen when you align yourself with the right people. It's so epic I can't even begin to describe it. You'll see what I mean tomorrow at my blog. I hate Blogger for changing their word verification! No more words like cockahop and titblue. Sigh. Hate the new Twitter. I had just gotten used to the old one and now I have to get used to it all over again. I wish they'd just leave that stuff alone. As for the new captcha -- another stupid invention. If I don't get it on the first try I blow off the blog. Sad to say. Re: followers. So many, so hard to follow so many. Great point about the interaction in blogging, it is a social media outlet, and it should be a two-way street. Sure, you can't respond directly to everyone, but not every comment warrants a direct response, either. Sometimes it's just a quick way for a follower to say "I'm still here, even though typically I lurk..."
I have rejected WV from the beginning but with this new one, sorry, I AIN'T DOING IT! Yes, I'm aware ain't is unacceptable but sometimes, for drama, no other word will do! Word verification was bad enough before now it is terrible and if I run into it I just run away so I really hope this topic will come up for the A-Z challenge. I think there are many bloggers that actually do not know that they have it or how to get rid of it. I have read it's not the followers you have it's the content you provide.. That is what makes us all comeback, I agree... but it's a nice feeling to see a new follower pop up in the followers box. It's our way of knowing that we are not alone and what we do matters. Second, I too am a human... I am having trouble with the new verifications, I cannot read them very well. I am slightly dyslexic and I have enough trouble typing let alone some-type of word problem. That word verification is a real pain. I wish people would lose it altogether. I have like one spam a year on my site. I like Twitter's new look, but like anything it takes a while to get used to finding where everything is. Okay, I'm off to check out the TBR site over at Cat's blog. I am an equal opportunity blogger. Humans and non-humans welcome. Alex, I despise those captcha thingys. I can never decipher the letters. the new word verification is really adding to my blogging time, and that is a problem. Joshua, maybe that's it - I only view online. Jeffrey, now you have me curious! Anne, took me forever to find my Twitter messages. Gail, that word works for me! Sic, trust me - I am the one talking about comments next month on the A to Z site and I will mention it. Jeremy, must be impossible for you then. Got rid of the verification yesterday - it was beginning to really annoy me too. I'm beginning to question my eye sight because for the life of me, I can't get those words! As far as followers and blogging, I try to follow the example of bloggers like you, who are encouraging and share their knowledge - so Thank you! I never liked those word verification things. I never put them on my blog because I don't want to put anyone through that, and I wouldn't wish them on my worse nemesis. Also great advice! I don't nearly have as many followers as you, but I always visit my followers blogs and try to reply to their comments. I had to go back to the older dashboard. I think I found out how to turn it off. Hopefully it worked. It IS about the connection not the numbers and it CAN'T be easy for you to say this because you have so many followers. You stay connected more than anyone I know. I'm happy to report that several of my online connections have turned into true friendships that extend beyond the blog. It really is all about taking the time to invest in people and not about building up numbers of followers. And I can't even believe you doubt your popularity. Puleez. It's true. It's not possible to be friends with >1000 followers. People are too busy and we have lives to live. But you make some excellent points, and you have always shown yourself to be a great blog friend. I'm kinda concerned about GFC ... Have you find a substitute yet? When you read literally HUNDREDS of blogs a day, spending five mother$%^&*(^& minutes to enter the captcha really adds up. If I fail twice in a row, I give up. Word verification needs to die. Just a couple of years ago, bots were just flooding Blogger, but it's gotten better. In fact, I'm thinking they've developed a bot-killer, as I saw a SPAM comment left on my blog via my email, but it didn't show up on my actual blog! I only have 80+ followers, but you're right about making true connections with a certain percentage of them. Just like in "real life," you do get a feel for people via the blogosphere. I will say that I'm happy you and I are regulars on each other's blogs. Since writer blogs are pretty female dominated, it's nice to find some testosterone on here! The new word verification thing drives me mental. One word was just about doable, but now TWO? and half-obscured most of the time too... gah. Z needs to get rid of before April comes. Just following a blog and thinking they'll follow back is not a good plan--I often don't notice when someone has just clicked the Follower button. They need to leave me a comment so I'll know. Alex, I laughed at the beginning of this post. I'd just read three bloggers who used word verification and the new process slowed me down so much I was close to cursing. Thank you for making this point! As for followers, you are right. There are those we connect with and those we don't but you have to put yourself out there in order to develop "relationships." A blogger I read sometimes posted yesterday that she was going to stop posting because she wasn't getting responses. But she admitted she wasn't up for the back and forth required to develop a following. Read as: she didn't want to put the effort into commenting on other blogs. She closed herself off and I felt sad for her. I ranted at Clarissa's yesterday about the new word verification mess. Twitter changed, but it was pretty easy to find my way around again. And I couldn't agree more about blog relationships. I love my followers. Now I'm off to TBR. CAPTCHA drives me insane. Half the time I can't read the letters and just give up. yeah, no thanks on the captcha. I do have a list a blogging friends i try to hit every day. And even if i don't, they're at the top of my list when i do find time to check out blogs. I've been mentioned in Alex J. Cavanaugh's blog! I have learned so much from blogging the past year. The most important realization was how eager I was to get to 100 followers. Now I'm there, my efforts have shifted to really working on establishing relationships and connections with bloggers. Somewhere along the way, I started to focus on quality not quantity. I hope to one day have the problem of too many followers :) I admit I like the new Twitter better, actually, but I am on there way too much. Hi Alex .. excellent post - and yea .. life is about friends - as is the blogging world .. and so true - we can go fast, or we can go slow - but friendship is the name of the game ..
Congratulations though on setting examples for us to follow .. The new captcha is infuriating and I'm glad that you are taking the time to highlight it here. Hopefully people will take it down. You are so dead on the money from everything I know about blogging. For me, it became impossible to visit everyone before I even got to the 500 mark so you definitely have a higher threshhold. I try to make it a goal to visit everyone within a single month. I know that doesn't sound like I'm much of a follower for some ppl but at least they get a little attention. amen! turn that verify off! ack! and another bit of great advice for blogging. if a blog of a new follower doesnt strike me right away, i wait to folloe back to see if they're "serious" about liking me by their comments or just looking for #s followbacks. i'm not in it for the numbers, i want connections and productive communication =) thanks! Yes, there are quite a few, like you, who I've made special connections with. I don't know how you manage to keep up with so many followers. I admire your effort! As for Killswitch Engage, that's one of my son's favorite bands so I'm used to hearing it. Doesn't make it any easier to swallow, message or no. And I HATE the new WV. I've never used or had a problem. Wish everyone would get rid of it. Really, spam is not a problem. Have a great weekend, Alex! I hate the new word verification things. But I do like the new Twitter look so far. And I completely agree. I've met so many new friends through blogging. You can't interact with everyone (sometimes I can't even interact with my close friends as much as I would like), but it's those connections that mean so much. Thank you for bringing up the new Word Verification thing. I HATE IT! It's even harder to read and honestly, I gave up several times this past week. I turned it off a long time ago and I've had very little spam, so I would encourage everyone to do the same. I will check out the TBR and I again appreciate the reminders on how to gain an interactive following. I'm trying, man. Second post I read on this word thingy today and it is indeed vexing. I disliked the last one as well. This is such a wonderfully informative post. I'm working on those connections too but the challenge is weeding out those who aren't responding. I comment constructivelybon some blogs and never hear from them. Thank you and have a fab weekend. YIPPEE - Everyone hates word verification. I hope they listen and TAKE IT DOWN. It's making me crazy, and we all know what a short trip that is. You are one of the best 'friends' out there. Definitely, one of the 'good guys'. DL asked for a plaque, when I get around to it, I'll send you one too. Do you think it is rude to directly post on someones blog to turn off the darn verification? I try to bribe followers with cupcakes. Great interview over at TBR, Alex! That word verification is so annoying :( ...and also, why is it two words instead of one? Can robots magically see one word and not the other? ._. I've just read your interview at TBR. As Rick said : it was quite an enjoyable interview. As Susan Roebuck said : I truly dislike the new 2 word verification! I have mentioned it on some blogs I've visited, knowing it is their cyber-homes, of course, to do with as they wish. My time is so limited that trying to peer at upside down and blotted out letters makes me hesitate to re-visit those 2 worders. I don't like that new word verification thing either. I've never had any bots to worry about. I'm still making connections and most of them are wonderful people. There are a few certain bloggers that are special to me too. I always check out the blog of any new follower I get; although, I don't always follow them back. Time-wise, right now, I'm already beyond my limits, so I've had to be more careful about just hitting the follow button. However, I do always respond to comments, and, if you are a frequent commenter on my blog, that certainly makes it more and more likely that I will get involved with your blog, too. I like reading Blog Followers, the Series, Alex. Keep it up for us small beans bloggers. That interview at TBR was interesting and I liked your news. By the way, have you read the Gateway novels of Frederik Pohl? Have a great weekend and thanks for the comment on the 11 Questions Tag post. I took the word verification off my blog but have to keep comment approval on. Trolls exist and not only in LOTR. Totally agree about the twitter. Everytime I figure it out they change it so I end up back where I started. Connections are important. I think you're one of the few who I've seen go from few to many and still be the same. I've followed a few blogs where the person "changed" after reaching a certain # of followers which really put me off. Not that I"m sure they cared by that point but it's one reason I enjoy your blog. If there's a 100 or 1, you're still you. Alex, I'd like to turn off the word verification thingy on my blog but can't find the option to do that - can you help? Definitely hate the new "not a robot" thing. I've hated comment verification for a while now, actually. And yeah. I can't get to every blogger. I'm trying, I swear. I have been getting my 10-15 blogs/day and that has to be enough for now. Gossip Girl, it's in your blog's settings under comments. Marta, good for you and thanks! Juliana, Linky Tools friends is new and there are no boundaries. Jay, the spam is caught often. And yes, so few dudes online! Lee, I will tackle that in my March post. Liza, she's missed the point. Suze, I'll send a box. TL, thanks for the laugh! And friendships are more important than numbers. Michael, I almost mentioned that a blog with five hundred followers should have fifty comments apost, which yours does! DG, no I haven't read those. Great post on TBR and yes catcha also drives me nuts - some of them you can't even make out the letters. I'm with you on the word verifications. They are so unnecessary now too because blogger is great for picking up the spam. And yes, I totally agree with you re making the connections. So much more important than numbers. I've had so much trouble with my internet of late that I decided to preschedule your book release. It should magically appear on Feb. 28 at 12 midnight mountain standard time. You must be excited. I've never liked the word verification but the new one is almost unreadable for me! I have my special connections amongst bloggers - it's like standing in a crowd. Some you'll gravitate toward more than others. I think what sets people like you apart is you give the appearance of paying attention to each and every one of us. I think you'd still have that gift even if you had 5,000 followers. Maybe some day you'll bottle up that secret and sell it! I actually just turned off my word verification yesterday. I have a really hard time reading some of those words! If I have a problem with spam comments, I'll just go back to having to approve the comments and try to stay on top of it. No way am I making people have to mess with the new word verification! Great post, by the way! I agree with you all the way. There are connections that will certainly be stronger, but to make those connections you have to put in the effort, just as you would with in-person relationships. The new word verification drives me CRAZY!!! As for friends, I truly have some blogger friends that I love - they are supportive and we connect in many different social media sites. Can't wait to meet some of them in person, but truly consider them some of my dearest friends. You don't have to buy my hot tamales - you just have to show me how to switch it off. I keep saying that I'm going to but then I get in there and can't find it!!! At least, I'm pretty sure that mine is still on. And how do you find the time to guest blog?? You are the busiest person I know between your own, guest blogs, comments and your books!! Patsy, go into settings - it's under comments. George, you have blog owner approval - that's all that you need. Elana, I hit a hundred, but that's all I can do. Morgan, thank you so much. I'm not fond of the new twitter myself. I liked the layout before. Now I have to press extra things to get my lists. Don't they understand I don't have the attention span? You really are the best when it comes to making connections with bloggers. I try but I just go through periods where it all seems too much and then I have to back off for awhile. With as many blogs as you follow though I think everyone understands when you can't get around every post each week. I haven't really seen the new word verification yet. Most of the bloggers I follow have had theirs turned off forever. Love this post, and you are DEFINITELY one of the popular ones! Hahaha, you always brighten my day when I read your comments. Word verification. Aggh. Hate it. Personally, I like the new twitter. I know it's not to everyone's liking but given time they'll come around! Love your point that it's the connections, not the numbers. That's what really makes blogging worth it-- connecting with people and actually becoming friends! TS, thanks! And you'll know it when you hit it. Thanks, LisaAnn - I try! Ellie, I just haven't had time to play with it yet. The new word verify is horrible. You can' even read them. Is it torture? I think so. Sometimes I just have to give up. I hope everyone listens to you about the word verification. Some of them are really difficult to read. Ack! Does my blog have word verification? I need to research. I have really loved this series. You are so good at visiting people...so it is cool to see how the Ninja does it. :-) Have a great weekend! I think I'd rather they used a gom jabbar to make sure I'm human than those awful word verification things. Hey Alex. I tried to post a comment earlier but I was writing on the Nook and it likes to sometimes disconnect in the middle. Anyway, I cannot stand the new word verification. It's a nightmare. Today I was posting on a blog and I had to refresh six times before I could find one I was able to read. But ... I'm still super duper excited about that toothpaste. Have a groovy weekend and boogie boogie. I can't stand the new word veriication, either. Yuck! I can't wait to see who you're going suprise on Monday. You always do the coolest things for your Ninja Army. Off to check out TBR! Only 10 more days til CassaFire!! Whoo Hoo! Tracy, I'm glad you've enjoyed it. Whisk, hate the verification, love the toothpaste deal! I've just turned my word verification off. Thanks for the advice. I've decided to become a robot so I can read those bloody things! Thanks for the TBR link. funny thing is I always get the letters right, but my vision is skewed now because of it.. I have to thank you, Lee and all of the A-Z challenge bloggers for showing me the way. Maybe because you were mainly writers, but writers are the best bloggers! They comment more than any other group I am in. They comment on comments; they go out of their way to make you feel included! Thanks Alex! I think I have that human checker thingie turned off . . . I will double check. I don't like them either. I agree, followers are good, connections are best! Alex, I can always count on you to make me feel better. Thanks for stopping by. Kindered spirit... you betcha. You know that when Y and movies equal Young Frankenstein. Oh and I still haven't found everything on the new facebook, much less twitter ...just when you think you go a handle on it ...they go and change the grip. Yes, those words really horrific check. I hope that bloggers dispense with them more often. Great advice on blogging, Alex. And congrats on reaching so many followers! Wow! Over 1300! But you deserve it because you work so hard and you're a genuine person. I don't know how you do it, Alex, but you are the embodiment of "friend" to so many on the internet. Now I will feel extra grateful and excited when I see a comment on my blog from you, knowing how busy you are. Thanks so much. And I'm with ya on that captcha thing. Yuck. Michael, thanks for turning it off. Ella, thank you for your kind words! Pamela, thanks and that's funny! MISH, sorry you'll lose the Google Friends Connect. Alex, perfect post for me to read. Do they really need to make that new word verification thing so hard to read?! As far as fave bloggers, I like ones who make me laugh, or delve into offbeat but cool topics that I haven't read about a zillion times. But honestly, there is something to like about each of my followers. It's funny how well you can get to know someone without even meeting them. I don't mind filling in word verification on other blogs, but I want visitors to my blog to forego the step. And yes, I *think* the new-look Twitter is a good thing, but I need to get used to it first! I love the connections I've made through blogging -- I remember having a French pen pal in school, and now it's like having hundreds of e-pals all over the world. You can't have 1300 followers and not be popular. Thanks for your wonderful series on the alphabet challenge. As you remember I was with the very first challenege and I have met life long friends. I stopped blogging for over a year and the bloggers that checked on me was overwhelming. They missed their friend and my blog. What a wonderful feeling. Good writing to all! I got rid of the word verification some time ago to make it easier on my readers. Blogger is finicky enough to leave a comment and I've had many complains from my followers, especially those who have the Wordpress blogs. I've made quite a few good friends with my followers. You're right - it's the connection that matters, never the numbers. Angela, it's all about the friendships. Great post, Alex. I cherish the connections I've made through blogging. I still remember (and interact with) the first person who followed my blog a few years back. Interaction is so much more important than numbers. You're definitely a popular blogger. :) Thanks for the following tips! I hope mine's turned off - it's meant to be! I definitely have some very special bloggers who I love dearly... and there are the super-fun fab lot that potter in now and again to say hi. Yes, you're right, I publish a daily basis and I'm best to discuss with the time available, my blog and can not grow. My goal is to keep my current situation. You have so many awesome followers because you are awesome to them. You don't just say it, but live it. You always impress me because with all of the projects you're working on and all of the bloggers you have to write for, you always find time to comment on my blog and those of others. You deserve much more than 1300 followers for sure! Cat, I'm not sure I remember the first person to follow me! Golden, I've messed it up ten times today at least! Laura, nothing wrong with being a romantic sap. 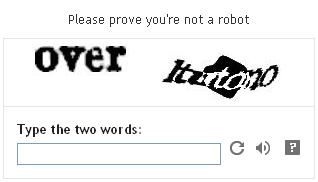 I'm finding I can't decipher the letters in the "prove you're not a robot" thing. Seems a robot would be better at it. Thanks for asking people to finding an alternative. Of course I agree about connections. Blogging is mainly about connections, secondarily about writing. And I'm lucky to have you as one of my most best blog friends. Great post my sweet friend. Change can be a good thing,I know. Yes I have expressed concerns about losing followers. But it's natural to feel a sense of accomplishment and validation when people like your blog so much they want to connect with you.Then there is a natural sense of loss when you realize you may be forgotten because you know longer show up on a blog list. I am happy we are bloggy friends.Biggest Hugs ! Man, I love reading all these comments! So yay for not having that stupid word verification. I curse every time that stupid thing comes up and I have to freakin' guess what the heck I'm supposed to put in there, lol. And yes, you are very popular Alex. :) What makes you even more awesome is you don't even realize it! There are several blogging buddies who are very special to me. They comment on almost every single one of my posts, even when I'm in a funk and haven't been able to travel to theirs. I'm catching up though, because they are amazing people. You connect Alex, and I'll chip in on the Tamales. I feel like a handicap or a participant asking to buy a vowel. Yeah that stupid WV crap has to die. Not even a rhyming nut can decipher that. Yep, all about connections, what makes it more fun. Monti, then try blog owner approval instead. Robyn! I'm lucky to have YOU. Katherine, and we've been blogging buddies for a while now! Cassie, thanks. And I have a lot of buddies who come visit me no matter what. It's just amazing. Oceangirl, I like that description of word verification! Pat, it's got to go! Word verification can be a pain, but my brother and I just got tired of deleting SPAM or approving comments all day. It takes a bit of effort to comment on our blog (as Michael said), but I appreciate you making the effort Alex. You're our number one commenter! I've never used WV. Don't plan on starting now. And yes, you are very popular. Of course you are popular, Alex. You are like the Prom King to all of us. Seriously, you are awesome. When I read your comment from Conway it made me think of how often I have come across blogs that I really love, but I tend to shy away from because they have thousands of followers. I think to myself that they are far too busy to take time to get to know a new follower. I decided to go ahead and follow and comment if I really like the blog content or the bloggers personality. You changed my mind (albeit, my preconceived judgmental mind) You always take the time to reciprocate and to get to know your followers. I have been pleasantly surprised by others as well. There have been a few blogs with thousands of followers where I have felt a little disappointed after leaving quite a few comments and never getting a response. Oh well. Thank you, Thank you for the advice and tips on removing the robot catcha form. It is driving me nuts!!!! ANd thank you for mentioning that nasty new word verification bugger. It's killin' me!! Man this scrolling down to the end was tiring. You are Mr. popular these days... Well deserved! You are a committed friend to all of us and as for me I really DO appreciate it. Lately my life has been in a cyclone. Just when it touches down and I have some normalcy and catch up the cyclone whirls again. EEESH! I am really trying to whip the cyclone out honestly. Thanks again for your friendship and loyalty. Yes, I think we all have certain bloggers of special interest to us in your comments and value highly. Greetings. Maurice, yours is no problem! Melissa, thanks for following and commenting! I try to visit everyone who comments and certainly my blogger buddies. You guys are the reason I'm where I'm at! PK, it's not the record - 220+ is the record! Michael, you have been missed! Thanks in advance for helping with the Catch Fire! Blog Party. Not only is the new.word verification a pain, you don't even have to type it in correctly, to get accepted!